The winning name is SQUIRT! Congratulations and thank you to Laurel Sterling from Crosby, Texas for the great name! Laurel also won a family four-pack to the Moody Gardens attractions and a penguin encounter which gives her a chance to meet a real penguin up close and personal. 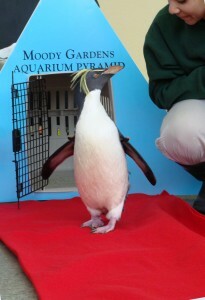 Posted on December 18, 2009 Author Moody GardensCategories Aquarium Pyramid, Events, General4 Comments on Name the Baby Penguin Contest! Penguins, penguins, penguins… Baby boom continues. Over in the South Atlantic exhibit at the Aquarium Pyramid, we’ve got big news! We just had our first penguin egg hatching of the season! This kicked off what appears to be the penguin baby boom this season with 24 eggs laid. 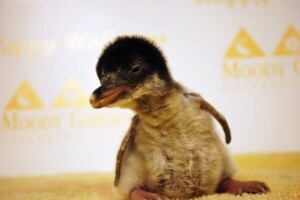 Our gentoo penguins Wiley and Marvin are now the proud parents of an adorable 94-gram chick. After around a month of incubating, the egg had a pip hole in it the afternoon of Saturday, Dec. 5. The Moody Gardens penguin biologists kept a close vigil throughout the day on Sunday, making sure the hatching process was going smoothly. Finally, on Monday morning, Dec. 7, we found a new member of our colony! After a quick check-up to get weight and a nice poop on the scale, it was back to mom and dad for our young chick. 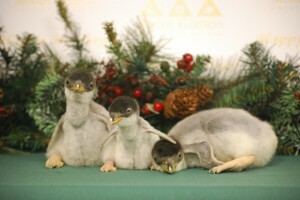 Three Gentoo penguin chicks are now a part of the Moody Gardens family. 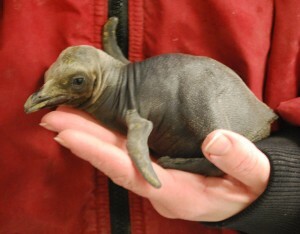 Additionally, our most recent king penguin hatchlings, now all grown up, are bound for the Central Park Zoo. Four of our birds, Lyle, Fred, Ducky DeLorenzo and Julian, left for the Empire State last Wednesday to join the Chinstrap and Gentoo Penguins already residing in the Polar Circle section of the Zoo. On Dec. 10, another chick hatched out, this one belonging to our gentoo penguins Casper and Ren! You can view them on the Webcam by checking out the ledge on the far right-hand side of the screen. Finally, on Dec. 13, Quagmire and Marge’s first egg hatched. This is a very important milestone for our gentoo penguins because Quagmire is the first gentoo born at Moody Gardens to successfully hatch an egg. While their nest is out of range on the PenguinCam, if you visit the Moody Gardens Penguin Exhibit and look to the far left on the ridge above the water, you will be able to get an unobstructed view of the nest. Also, look for the biologists trying desperately to check on the chick and not fall off the ledge and into the 54-degree water! This brings the tally for this season so far up to three hatchings, with several more expected. Keep checking the PenguinCam to get a gull’s eye view of our colony, and see some of our nests as the breeding season continues. Posted on December 14, 2009 December 21, 2009 Author Moody GardensCategories Aquarium PyramidLeave a comment on Penguins, penguins, penguins… Baby boom continues.